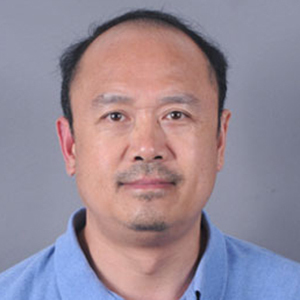 Chowdhary, J., Cairns, B., Zhai, P., Xu, F., Frouin, R., Stamnes, S., Cetinic, I., Liu, L., Twardowski, M., Hu, Y., Mischenko, M., Ottaviani, M., Remer, L., Boss, E., Lee, Z., Zhang, X., Dierssen, H., and Ibrahim, A. (16-Jan-18). Click here to view this presentation with audio. Lee, Z., Ondrusek, M., and Tufillaro, N. (17-Jan-17). Click here to view this presentation with audio. Inherent optical properties (IOPs) play a key role in modulating the color of oceanic and coastal waters, and provide the critical link to infer the concentrations of constituents in the upper water column. 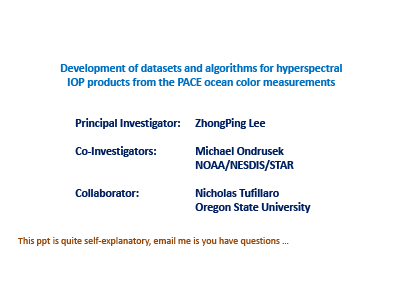 In the recent decade, various algorithms, both empirical and semi-analytical, have been developed for the retrieval of IOPs from ocean color, which is measured by the spectrum of remote-sensing reflectance (Rrs, sr-1). These algorithms, in particular the algebraic algorithm (QAA) and the spectral optimization algorithms (e.g., GSM, GIOP), have been implemented to retrieve various IOPs from Rrs measured by SeaWiFS and MODIS, thus providing prototype IOP products at a few bands for the global oceans. The quality of these products, however, depends on the validity of the spectral shapes of the IOPs (SSIOP) used in these semi-analytical algorithms, but the determination of the SSIOP from remote sensing is far from mature. 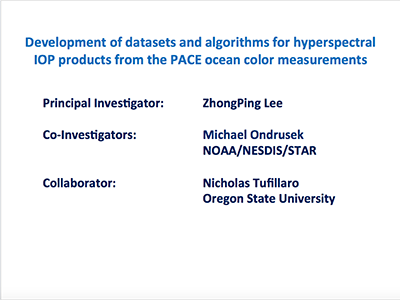 More importantly, the PACE mission will provide hyperspectral Rrs of the global oceans, thus the derivation of hyperspectral IOP products will demand accurate estimation of hyperspectral SSIOP. The improvement of the SSIOP estimation and the determination of hyperspectral IOP algorithms for PACE will depend critically on a robust hyperspectral Rrs-IOPs dataset, but there is no such a dataset yet for the community to use. To fill this void, with an ultimate goal to maximize the IOP products from the PACE hyperspectral measurements, we propose to 1) compile a hyperspectral Rrs-IOPs dataset from field measurements; 2) improve the estimation of SSIOP from ocean color; 3) revise the QAA and HOPE (a hyperspectral optimization algorithm) to take advantage of the hyperspectral and UV measurements offered by PACE, with a goal to expand the current IOP products to include information beyond chlorophyll-a (e.g., the absorption coefficients of chlorophyll-b,-c, and phycocyanin); and 4) test and evaluate these semi-analytical algorithms with HICO measurements. 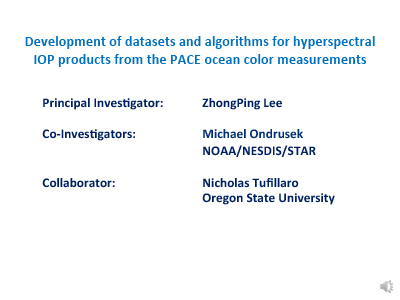 Outcomes from this effort will be fourfold: 1) a hyperspectral Rrs-IOPs dataset with closure for the community to use, 2) improved estimation of SSIOP from ocean color to benefit all semi-analytical algorithms, 3) revised QAA and HOPE to derive hyperspectral IOP products, and 4) experience with HICO in processing and storing hyperspectral image products. These results will provide desired tools and knowledge for processing hyperspectral measurements by PACE, and contribute to "consensus and communityendorsed paths forward for the PACE sensor(s). Werdell, P.J., McKinna, L.I.W., Boss, E., Ackleson, S.G., Craig, S.E., Gregg, W.W., Lee, Z., Maritorena, S., Roesler, C.S., Rousseaux, C.S., Stramski, D., Sullivan, J.M., Twardowski, M.S., Tzortziou, M. and Zhang, X. (2018). 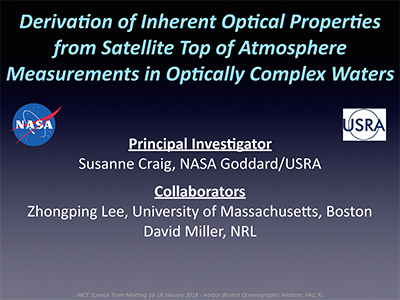 An Overview of Approaches and Challenges for Retrieving Marine Inherent Optical Properties from Ocean Color Remote Sensing, Prog. Oceanogr., 160, 186-212, doi:10.1016/j.pocean.2018.01.001 . 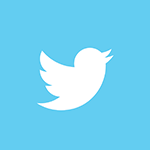 Lee, Z.P., Shang, S., Hu, C., Du, K., Weidemann, A., Hou, W., Lin, J., and Lin, G. (2015). Secchi Disk Depth: A New Theory and Mechanistic Model for Underwater Visibility, Remote Sens. Environ., 169, 139-149, doi: 10.1016/j.rse.2015.08.002. Lee, Z.P., Marra, J., Perry, M.J., and Kahru, M. (2015). Estimating Oceanic Primary Productivity from Ocean Color Remote Sensing: A Strategic Assessment, J. Marine Syst., 149, 50-59, doi: 10.1016/j.jmarsys.2014.11.015. Lee, Z.P., Wei, J., Voss, K., Lewis, M., Bricaud, A., and Huot, Y. (2015). Hyperspectral Absorption Coefficient of "Pure" Seawater in the Range of 350-550 nm Inverted from Remote Sensing Reflectance, Appl. Opt., 54(3), 546-558, doi: 10.1364/AO.54.000546. Lee, Z.P. and Huot, Y. (2014). On the Non-closure of Particle Backscattering Coefficient in Oligotrophic Oceans, Opt. Express, 22(23), 29223-29233, doi: 10.1364/OE.22.029223. Lee, Z.P., Shang, S., Du, K., Wei, J., and Arnone, R. (2014). Usable Solar Radiation and its Attenuation in the Upper Water Column, J. Geophys. Res. Oceans, 119(2), 1488-1497, doi: 10.1002/2013JC009507. Lee, Z.P., Hu, C., Shang, S.L., Du, K.P., Lewis, M., Arnone, R., and Brewin, R. (2013). Penetration of UV-Visible Solar Light in the Global Oceans: Insights from Ocean Color Remote Sensing, J. Geophys. Res., 118(9), 4241-4255, doi: 10.1002/jgrc.20308. Hu, C., Feng, L., and Lee, Z. (2013). Uncertainties of SeaWiFS and MODIS Remote Sensing Reflectance: Implications from Clear Water Measurements, Remote Sens. Environ., 133, 163-182, doi: 10.1016/j.rse.2013.02.012. 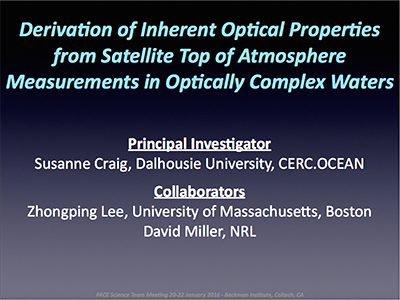 Lee, Z.P., Pahlevan, N., Ahn, Y.-H., Greb, S., and O'Donnell, D. (2013). A Robust Approach to Directly Measure Water-leaving Radiance in the Field, Appl. Opt., 52(8), 1693-1701, doi: 10.1364/AO.52.001693. Lee, Z.P., Pahlevan, N., Ahn, Y-H., Greb, S., and O'Donnel, D. (2013). Robust Approach to Directly Measuring Water-leaving Radiance in the Field, Appl. Opt., 52(8), 1693-1701, doi: 10.1364/AO.52.001693. Lee, Z.P., Weidemann, A., and Arnone, R. (2012). Combined Effect of Reduced Band Number and Increased Bandwidth on Shallow Water Remote Sensing: The Case of WorldView 2, IEEE Geosci. Remote S., 51(5), 2577-2586, doi: 10.1109/TGRS.2012.2218818. Lee, Z.P., Jiang, M., Davis, C., Pahlevan, N., Ahn, Y.-H., and Ma, R. (2012). Impact of Multiple Satellite Ocean Color Samplings in a Day on Assessing Phytoplankton Dynamics, Ocean Science Journal, 47(3), 323-329, doi: 10.1007/s12601-012-0031-5. Lee, Z.P., Hu, C., Arnone, R., and Liu, Z. (2012). 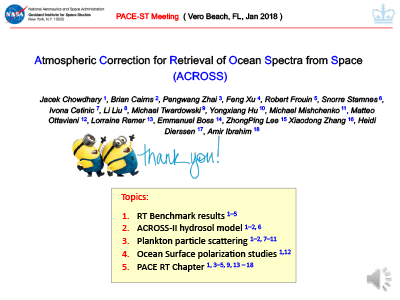 Impact of Sub-pixel Variations on Ocean Color Remote Sensing Products, Opt. Express, 20(19), 20844-20854, doi: 10.1364/OE.20.020844. Hu, C., Feng, L., Lee, Z.P., Davis, C.O., Mannino, A., McClain, C.R., and Franz, B.A. (2012). Dynamic Range and Sensitivity Requirements of Satellite Ocean Color Sensors: Learning from the Past, Appl. Opt., 51(25), 6045-6062, doi: 10.1364/AO.51.006045. Hu, C., Lee, Z.P. and Franz, B. (2012). Chlorophyll-a Algorithms for Oligotrophic Oceans: A Novel Approach Based on Three-band Reflectance Difference, J. Geophys. Res., 117, C01011, doi: 10.1029/2011JC007395. Lee, Z.P., Du, K., Voss, K.J., Zibordi, G., Lubac, B., Arnone, R., and Weidemann, A. (2011). An Inherent-optical-property-centered Approach to Correct the Angular Effects in Water-leaving Radiance, Appl. Opt., 50(19), 3155-3167, doi: 10.1364/AO.50.003155. 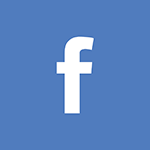 Lee, Z.P., Lance, V.P., Shang, S., Vaillancourt, R., Freeman, S., Lubac, B., Hargreaves, B.R., Del Castillo, C., Miller, R., Twardowski, M., and Wei, G. (2011). An Assessment of Optical Properties and Primary Production Derived from Remote Sensing in the Southern Ocean (SO GasEx), J. Geophys. Res. Oceans, 116(C4), C00F03, doi: 10.1029/2010JC006747. Hu, C., Lee, Z., Ma, R., Yu, K., Li, D. and Shang, S. (2010). Moderate Resolution Imaging Spectroradiometer (MODIS) Observations of Cyanobacteria Blooms in Taihu Lake, China, J. Geophys. Res., 115(C4), C04002, doi: 10.1029/2009JC005511,2010. Lee, Z.P., Carder, K., Arnone, R., and He, M.X. (2007). Determination of Primary Spectral Bands for Remote Sensing of Aquatic Environments, Sensors, 7(12), 3428-3441, doi: 10.3390/s7123428. Lee, Z.P., Weidemann, A., Kindle, J., Arnone, R., Carder, K.L., and Davis, C. (2007). Euphotic Zone Depth: Its Derivation and Implication to Ocean-color Remote Sensing, J. Geophys. Res., 112(C3), C03009, doi: 10.1029/2006JC003802. Hu, C., Lee, Z., Muller-Karger, F.E., Carder, K.L., and Walsh, J.J. (2006). Ocean Color Reveals Phase Shift Between Marine Plants and Yellow Substance, IEEE Geosci. Remote S., 3(2), 262-266, doi: 10.1109/LGRS.2005.862527. Lee, Z.P. and Hu, C. (2006). Global Distribution of Case-1 Waters: An Analysis from SeaWiFS Measurements, Remote Sens. Environ., 101(2), 270-276, doi: 10.1016/j.rse.2005.11.008. Lee, Z.P., Du, K.-P., and Arnone, R. (2005). A Model for the Diffuse Attenuation Coefficient of Downwelling Irradiance, J. Geophys. Res., 110(C2), C02016, doi: 10.1029/2004JC002275. Lee, Z.P., Darecki, M., Carder, K.L., Davis, C.O., Stramski, D., and Rhea, W.J. (2005). Diffuse Attenuation Coefficient of Downwelling Irradiance: An Evaluation of Remote Sensing Methods, J. Geophys. Res., 110(C2), C02017, doi: 10.1029/2004JC002573. Lee, Z.P. and Carder, K.L. (2004). Absorption Spectrum of Phytoplankton Pigments Derived from Hyperspectral Remote-sensing Reflectance, Remote Sens. Environ., 89(3), 361-368, doi: 10.1016/j.rse.2003.10.013. Lee, Z.P., Carder, K.L., and Arnone, R.A. (2002). Deriving Inherent Optical Properties from Water Color: A Multiband Quasi-analytical Algorithm for Optically Deep Waters, Appl. Opt., 41, 5755-5772, doi: 10.1364/AO.41.005755. Lee, Z.P., Carder, K.L., Chen, R.F., and Peacock, T.G. (2001). Properties of the Water Column and Bottom Derived from Airborne Visible Infrared Imaging Spectrometer (AVIRIS) Data, J. Geophys. Res., 106(C6), 11639-11651, doi: 10.1029/2000JC000554. Lee, Z.P., Carder, K.L., Mobley, C.D., Steward, R.G. and Patch, J.S. (1999). Hyperspectral Remote Sensing for Shallow Waters: 2. Deriving Bottom Depths and Water Properties by Optimization, Appl. Opt., 38(18), 3831-3843, doi: 10.1364/AO.38.003831. Lee, Z.P., Carder, K.L, Steward, R.G., Peacock, T.G., Davis, C.O., and Patch, J.S. (1998). An Empirical Algorithm for Light Absorption by Ocean Water Based on Color, J. Geophys. Res., 103(C12), 27967-27978, doi: 10.1029/98JC01946. Lee, Z.P., Carder, K.L., Marra, J., Steward, R.G., and Perry, M.J. (1996). Estimating Primary Production at Depth from Remote Sensing, Appl. Opt., 35(3), 463-474, doi: 10.1364/AO.35.000463. Lee, Z.P., Carder, K.L., Peacock, T.G., Davis, C.O., and Mueller, J.L. (1996). Method to Derive Ocean Absorption Coefficients from Remote-sensing Reflectance, Appl. Opt., 35(3), 453-462, doi: 10.1364/AO.35.000453. Lee, Z.P. (1994). Visible-infrared Remote-Sensing Model and Applications for Ocean Waters, Ph.D., University of South Florida, St. Petersberg. pp. 145. Lee, Z.P., Carder, K.L., Hawes, S.K., Steward, R.G., Peacock, T.G., and Davis, C.O. (1994). Model for the Interpretation of Hyperspectral Remote-sensing Reflectance, Appl. Opt., 33(24), 5721-5732, doi: 10.1364/AO.33.005721.